I was raised on American 50’s cuisine, so my palate has been somewhat limited. A year ago, I didn’t like Indian food and based on one experience, I didn’t like Thai food. But Denmark is changing that. Now I’m the one trying to sell the group on Indian takeout instead of pizza, I have 3 types of curry paste in my fridge, I know which shop has the best price on coconut milk, and I can even identify lemongrass! 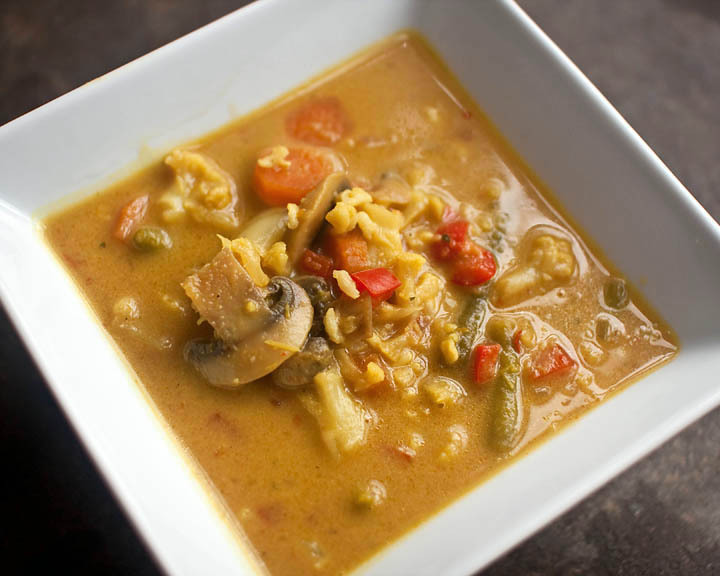 This is my base recipe for thai vegetable soup with coconut milk and curry. The veggies can be tweaked to what’s in season or what you’ve got on hand. Heat a bit of olive in a soup pot, then cook the onion, garlic, ginger, and carrots until tender. Add everything but the rice and simmer for 25- 30 minutes. It’s best to go easy on the curry paste and adjust to taste, the heat sneaks up fast. The soup will be very thin. Puree about half of the veggies in a blender or food processor with a little bit of the broth and add the puree back to the pot. This will give you a nice combo of a rich, creamy texture and whole veggies. Stir in the rice and it’s done! Yum, that looks like a delicious soup. Thanks for the recipe! I did try this soup and added some tofu to it. It was delicious!I think I ended up using about 2 tbsp of curry paste, added 1/2 tsp of red chili sauce and added and 4 tbsp of soy sauce since I didn’t have stir fry sauce. The soup cam out perfect! Thanks again for adding.